The Apple iPad mini 4 is now available in India. The 16GB Wi-Fi only version is priced at the equivalent of $445 USD. The 64GB Wi-Fi only model is tagged at $553 USD, and $647 USD buys the 128GB Wi-Fi only variant. If you want the cellular and Wi-Fi model, equivalent U.S. pricing for the 16GB, 64GB and 128GB versions are $599 USD, $707 USD and $814 USD, respectively. 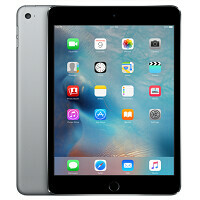 The Apple iPad mini 4 features a 7.9-inch screen with a resolution of 1536 x 2048. That works out to a pixel density of 324ppi. Under the hood is the Apple A8 chipset, carrying a dual-core 1.5GHz CPU and the PowerVR GX6450 GPU. 2GB of RAM is inside, and a 5124mAh juicer keeps the lights on. Earlier today, we told you that the Apple iPhone 6s is being priced out of the reach of most consumers in India. With a starting price for the 16GB Apple iPhone 6s equivalent to $925 USD, it isn't hard to see why sales of the new iPhone models in the country are declining. Considering that in the U.S. the 16GB Wi-Fi only iPad mini 4 is being sold by Apple for $399, the premium for the tablet in India is much smaller than it is for the iPhone 6s. Indians aren't blind as Americans to get iRipped-off! Depends on an individual. Many Indians will still buy that costly iPhone. 2 of my friends already did. Having an iPhone is like achieving something big for Indians. But yes, this time the sales will be affected due to high price. Americans Aren't Getting Ripped Off Tho LOL. So it's gathered you love both America and apple. $500 for a Mini? Ouch. May have to sell some rocks and ammo. okay okay we get that you love apple, but seriously bro chill, you might get banned for showing so much love. You're on the edges if not already, of trolling. It's expensive over their. Really too high over here. Just like our cars and fast food. Everything cost too much now. But if you earn the money you can decide do what you like. I try to keep my devices 2 years now. The iPad mini costs almost half of the iPhone (in reference to the other article today), while is more than twice the dimension? Sure wish I could trade my 500 square foot apartment for one that is 1000 sqft, while paying only half of my current rent.